note: includes Baffin Bay, Barents Sea, Beaufort Sea, Chukchi Sea, East Siberian Sea, Greenland Sea, Hudson Bay, Hudson Strait, Kara Sea, Laptev Sea, Northwest Passage, and other tributary water bodies. 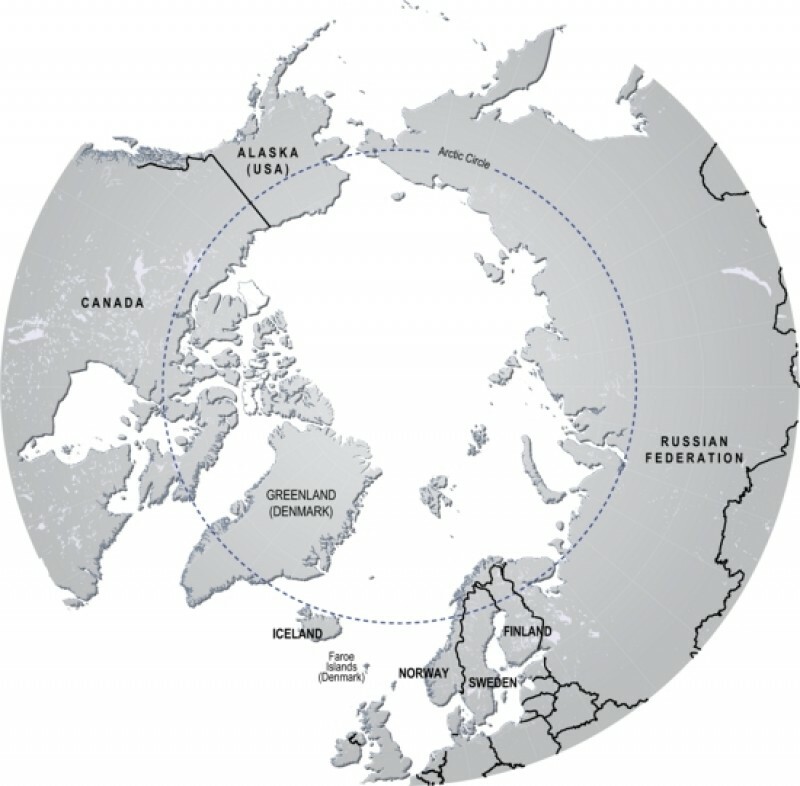 The Arctic consists of the Arctic Ocean (which overlies the North Pole) which is bordered by the northern parts of the mainlands of Canada, Greenland (a territory of Denmark), Russia, the United States (Alaska), Iceland, Norway, Sweden and Finland, and their outlying islands. Some of these islands are mountainous with interior icecaps, such as Greenland and the northern half of Novaya Zemlaya. 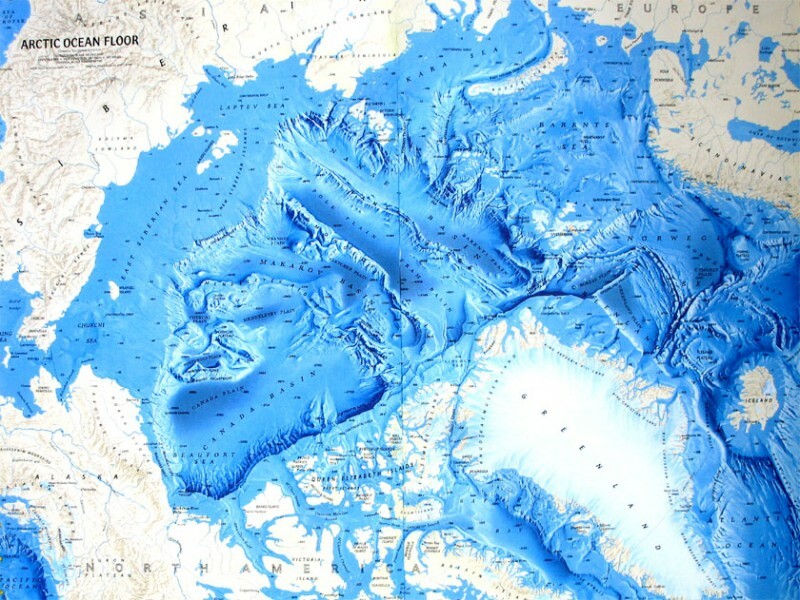 Others are low-lying and not glaciated, such as Wrangel Island and the western islands of the Canadian Arctic. The climate within the Arctic Circle is very cold and much of the area is always covered with ice. In the mid winter months, the sun never rises and temperatures can easily reach lows of - 45º C (-50º F) in the higher latitudes. In the summer months (further south), 24 hours of sunlight each day melts the sea ice and topsoil. The video on the left illustrates the advance and retreat of sea ice over a period from January 2003 to May 2010. A recent NASA-led study found a 23-percent loss in the extent of the Arctic's thick, year-round sea ice cover during the two winters. Between winter 2005 and winter 2007, the perennial ice shrunk by approx 964K sq km (587 sq ml). This drastic reduction of perennial winter sea ice is the primary cause of the fastest-ever sea ice retreat on record. Scientists say the rapid decline in winter perennial ice was caused by unusual winds. Polar ice reflects light from the sun. As this ice begins to melt, less sunlight gets reflected into space. It is instead absorbed into the oceans and land, raising the overall temperature, and fuelling further melting. This results in a positive feedback loop called ice albedo feedback, which causes the loss of the sea ice to be self-compounding. The more it disappears, the more likely it is to continue to disappear. 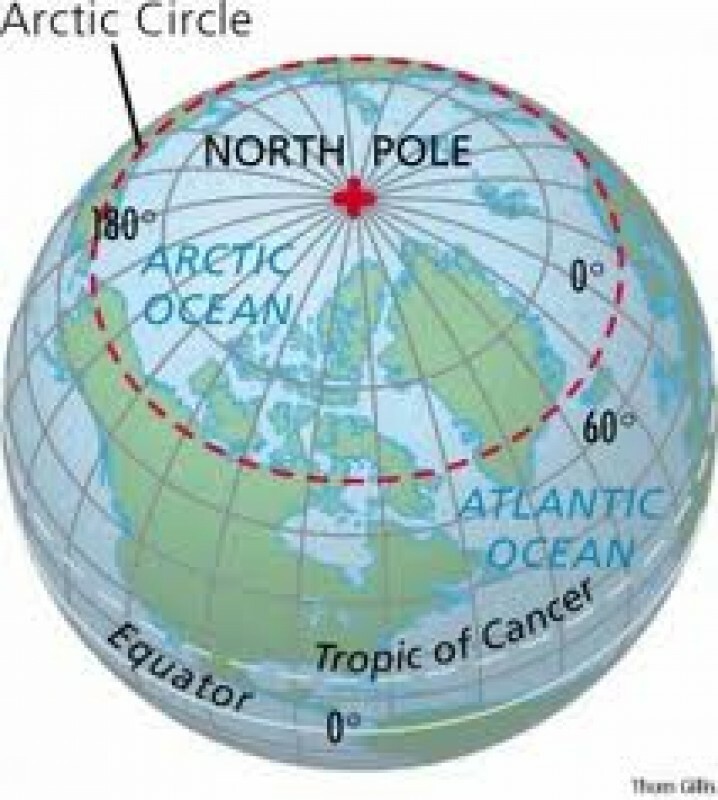 The Arctic are is slightly less than 1.5 times the size of the United States of America. The states with maritime claims are engaged in various stages of demonstrating the limits of their continental shelves beyond 200 nautical miles from their declared baselines in accordance with Article 76, paragraph 8, of the United Nations Convention on the Law of the Sea. 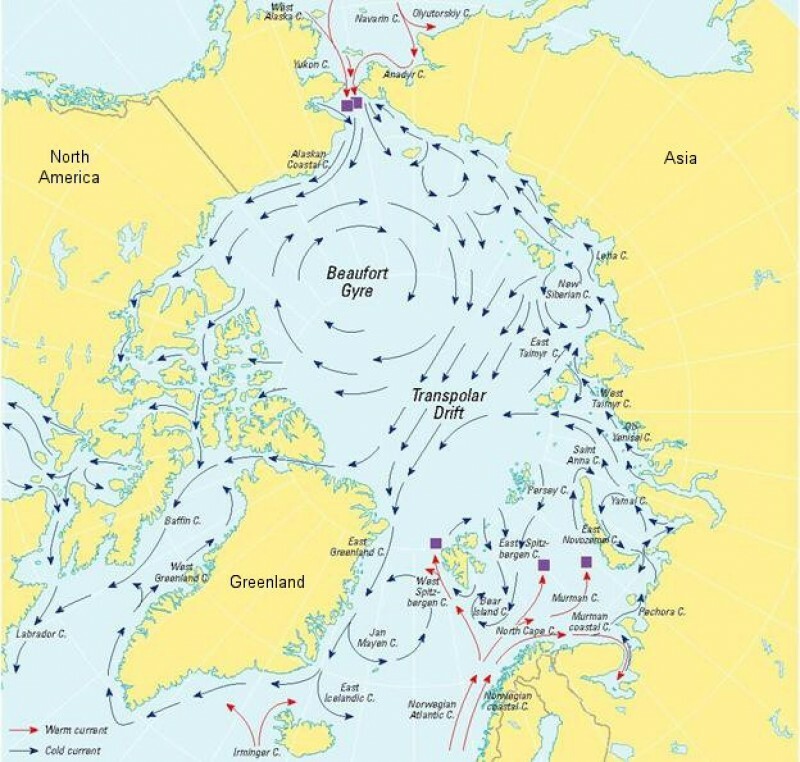 As a result of record summer melting of sea ice in the Arctic, interest in maritime shipping lanes and sea floor exploration has been restimulated. The Arctic polar climate is characterized by persistent cold and relatively narrow annual temperature ranges. Winters are characterized by continuous darkness, cold and stable weather conditions, and clear skies. In the summer months the conditions are characterized by continuous daylight, damp and foggy weather, and weak cyclones with rain or snow. sand and gravel aggregates, placer deposits, polymetallic nodules, oil and gas fields, fish, marine mammals (seals and whales). Ice islands occasionally break away from northern Ellesmere Island. Icebergs calved from glaciers in western Greenland and extreme north-eastern Canada; permafrost in islands; virtually ice locked from October to June; ships subject to superstructure icing from October to May. Endangered marine species include walruses and whales. The fragile ecosystem is slow to change and slow to recover from disruptions or damage. The thinning polar icepack. 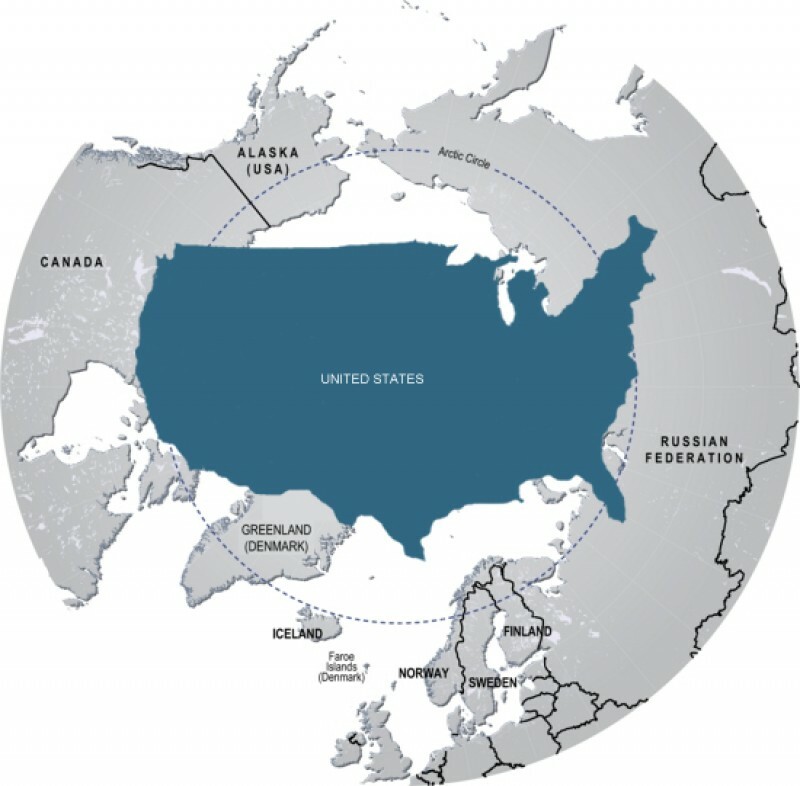 A major chokepoint is the southern Chukchi Sea (northern access to the Pacific Ocean via the Bering Strait); strategic location between North America and Russia; shortest marine link between the extremes of eastern and western Russia; floating research stations operated by the US and Russia; maximum snow cover in March or April about 20 to 50 centimetres over the frozen ocean; snow cover lasts about 10 months.